One of the questions I periodically get is “How do I choose a good pattern for my yarn?” I’d like to go more in depth with this issue, and go over some guidelines for choosing a good pattern that will show off your yarn at its best. When looking at patterns, we need to look at the yarn, and think about the color, texture, and materials. I’ve outlined the basic types of categories that yarn colors can fall into. Do note that some of these categories can overlap. The yarn is entirely or almost entirely one color. Solid colors are very versatile, and can be used with almost any project successfully. The yarn tends to stripe in the finished project, and features many yards of one color at a time. Self-striping yarns are great for more simple projects, as they can add interest to a simple pattern. The yarn is a few or many different colors, spread out evenly throughout the yarn. Depending on how the colors are spread out, this type of yarn has the potential to pool, or have groups of colors sit next to each other and create its own pattern. The yarn is a few or many different colors, often spread out in a random pattern. It does not usually pool. The yarn transitions smoothly from one color to another. Gradient yarn is labor intensive to create, and is either done by hand spinning the yarn or by dyeing the yarn in sections. The texture of the yarn generally refers to the number of plies (which determines roundness of yarn) or refers to how much of a “novelty” yarn it is. A singles yarn will have a similar texture to yarns that have three or more plies, in that they are all very round and are great for textured or cabled patterns. In general, the more plies a yarn has the rounder the yarn will be. 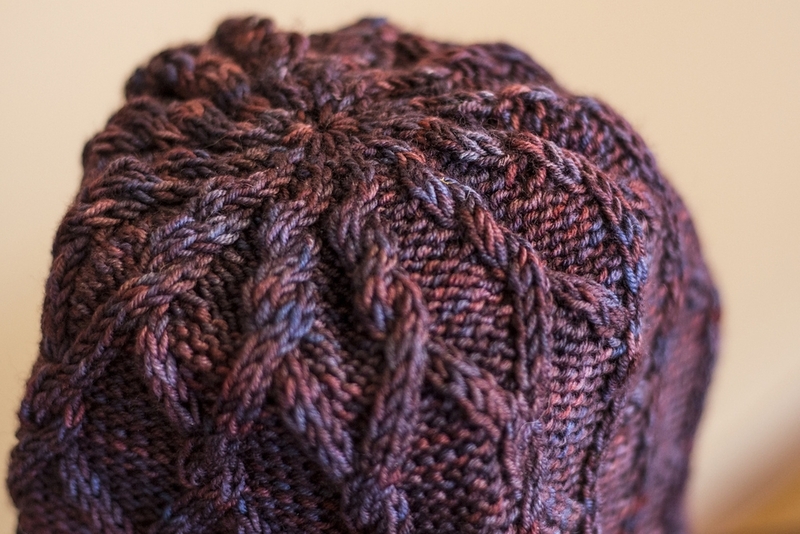 The roundness of the stitch makes textures in patterns such as these cables have a lot of dimension. Two-ply yarns are more textured, and that texture can detract from textured or cabled patterns. Two-ply yarns can be great for more delicate and intricate lace patterns, as well as more pieces featuring a lot of stockinette. Novelty yarns can cover a large group of yarns; they include eyelash yarns, yarns with halos, thick and thin handspun, ribbon, boucle, and yarn with other objects in them (such as feathers, beads, or sequins). For yarns with these features, it can be best to choose more simple patterns that won’t distract from the yarn. When working with more than one color, it’s important to keep in mind the contrast of the colors and its importance to the final project. A great way to see if colors will have enough contrast to be clearly seen is by taking a picture with a mobile device by switching it to black & white mode and comparing the yarns side by side. If you can easily tell the difference when it’s black and white, there’s enough of a contrast to make the colors pop in your project. ...until we find out that the pink and grey are actually very close in value. Here are some examples of projects that may not have worked out in an optimal way for showing off the yarn. Here’s an example of pooling. There are varying opinions on whether pooling is desired in a garment, and it can sometimes be avoided by alternating skeins. Here are a few examples of variegated or handpainted yarns in projects with too much lace or texture. The variety of colors in this shawl hides the shapes that were created while knitting this shawl. This yarn with sequins hides the cables and lace. It's hard to see in all those colors, but there are sequins in there! This is a low-contrast colorwork piece that was created on purpose as a gift to someone who is colorblind. The red and the green have similar values, and even though they are opposite colors, they are still challenging to pick apart from a distance. All of these suggestions are general guidelines, and are not in any way hard and set rules. I’ve found that, whether or not I have the yarn or pattern in mind first, being aware of how the yarns colors and textures can affect the final product is extremely helpful. Special thanks to Kate of Valley Ridge Yarns for loaning her shawl for photographing. Please go check out her site and yarn! More thanks to Sarah for letting me photograph her beautiful sock, and Reverie Yarn for letting me take sample photos! What techniques do you use when matching yarns with colors? Posted on July 24, 2014 by Caitlyn Faust and filed under Yarn Theory.